This program features four beautiful cards. You may request cards to recognize friends and family at significant times in their lives through a gift to the School Sisters of Notre Dame Central Pacific Province. 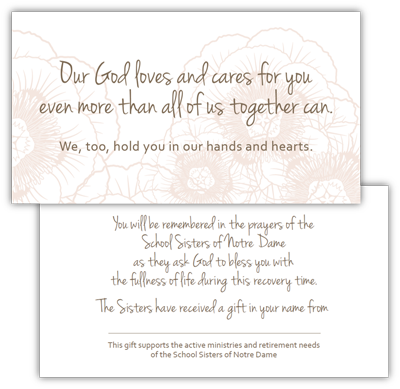 The four cards include: birthday, memorial, joyous occasion and recovery. Donations are not required, but always appreciated.